As you likely already know, Amazon is a huge reputable and successful online company. You’ve probably previously purchased something from Amazon.com and had a great experience. I’ve been hesitant to publish an article on Amazon Payments for a while because there’s already so much information about it available online. But since April just started and I just finished using Amazon Payments, I thought I would go ahead and detail the process. Amazon Payments is a payment system similar to Paypal. You can use Amazon payments to make purchases on Amazon.com as well as send money to other users and receive money from other users. If you want to Paypal someone money with your credit card, there is a 2.9% fee plus $0.30 per transaction. There are currently no fees for sending credit card payment (up to $1,000 per month) to other individuals with Amazon Payments. Let’s say your friend lets you borrow $50 to pay for dinner. You could give your friend $50 cash and not earn any points, or you could Amazon Payments your friend $50 charged on your rewards credit card and earn some points. Let’s say you need to spend an extra amount of money within a certain time period on the new rewards credit card you signed up for. Many rewards credit cards require spending a certain amount within a certain amount of time i.e. “spend $3,000 within 3 months to get 50,000 bonus points.” Amazon Payments can help you achieve that spend. 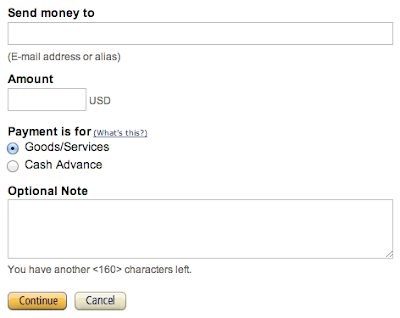 In order to set up an Amazon Payments account, you first sign in with your Amazon account. You will need to give Amazon Payments your social security number and date of birth to prevent duplicate accounts. Many users who have created multiple accounts have been shut down. To fully take advantage of Amazon Payments, you need to link your personal bank account. This is necessary to withdrawal money. and then make sure you select “Goods/Services"
If you select “Cash Advance” your credit card may charge you a cash advance fee, which varies by credit card companies. Then confirm your payment. That's it! When receiving funds in your Amazon Payments account, you can either keep the funds in there to purchase something on Amazon.com or you can withdrawal the funds directly into your linked checking account, which takes a few business days. You can also use Amazon Payments to liquidate any Visa gift cards that you have. All you have to do is first go to www.vanillavisa.com and register your Visa gift card online. When sending money to friends, it may be safer to send money in one direction, ie A to B. 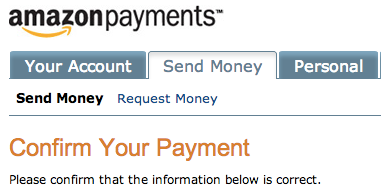 Users who send money from A to B and then B back to A may find their Amazon Payments account shut down. Transferring money from A to B to C and beyond works well in my experience. I personally advise taking it slow with Amazon Payments. I have never been charged any cash advance fees with multiple Chase, American Express, and Citibank credit cards. To make sure you don't get charged a cash advance fee, you can send a smaller amount first as a test payment. You can also call your credit card company and tell them to reduce your cash advance limit to $0. I usually send money in varying amounts such as $975, $765, etc and not an even $1,000 each time. With Amazon Payments, I quickly earn free points monthly. You can read the Amazon Payments user agreement here.